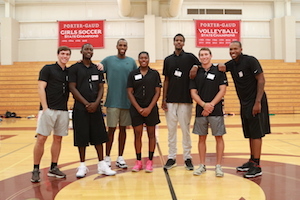 November 17, 2017 - Milwaukee Bucks forward Khris Middleton '09 has made a five -year pledge of $1 million to Porter-Gaud School to support scholarships for underserved and minority students in the Charleston area. The Middleton Scholars program will provide full or partial tuition and educational expenses for local high-school students (grades 9-11) to attend Porter-Gaud starting in the 2019-2020 school year. The Middleton Scholars program aims to increase diversity at Porter-Gaud by awarding scholarships to high achieving underserved and minority students. "The goal of my scholarship is to provide funding for a diverse group of students, who without help, would not have the financial means to attend Porter-Gaud. I dedicate much of my success to what I learned inside and outside of the classroom at Porter-Gaud, and I want to give that same opportunity to other kids in Charleston," says Khris Middleton. Middleton, who attended Porter-Gaud from grades 8-12, was an exceptional student-athlete. Coached by John Pearson, Middleton played Cyclone Varsity basketball starting in the eighth grade. As a junior and senior, he was named South Carolina Player of the Year, and was a McDonald's All-American nominee. He went on to play college basketball for Texas A&M University and earned second-team All-Big 12 honors. After college, the Detroit Pistons selected Middleton with the 39th overall pick in the 2012 NBA draft. In 2013, he was traded to the Milwaukee Bucks and re-signed with the team in 2015. This season, Middleton has averaged 18.6 points, 5.9 rebounds, and five assists per game and has emerged as a true leader for the team. Staying true to his roots in Charleston, Middleton has maintained a long-standing relationships with his former coaches, teammates, and the school - returning to train and condition in the summers and hosting his annual Khris Middleton Basketball Camp for boys and girls ages 9-17 on campus each year. "I've enjoyed seeing Khris on campus interacting with students and campers over the past few years. With his encouraging words and his gentle spirit, it is clear just how much he cares about the success of young people. We are profoundly grateful to Khris for his gift," says Head of School D. DuBose Egleston, Jr.
"This gift reflects the kind of person Khris Middleton is," adds Basketball Head Coach and Director of Diversity John Pearson. "It is yet another example of Khris and his family giving back to assist students across the Charleston community."